China's debt: a crisis in the making? 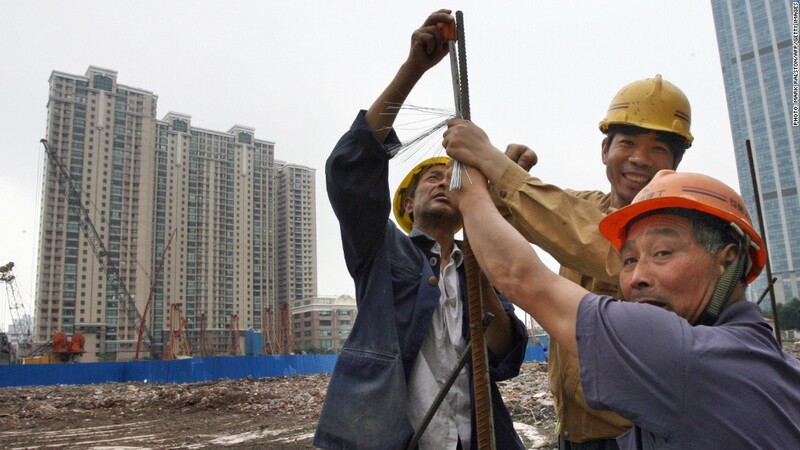 China's debt has grown substantially in the past decade, fueling infrastructure projects. The world's second largest economy has a debt problem. China's credit boom has saddled unworthy businesses with large loans, fueled the country's shadow banking system and put local governments on the hook for billions. Swiss bank UBS calculates that central government debt was equal to 15% of the economy at the end of 2012. That number spikes to 55% when debt racked up by local governments and agencies is included. If corporate and household debt is also counted, China's total debt load balloons to more than 200% of gross domestic product. Plenty of countries have more debt by that measure, including South Korea, Japan and the United States. But compared to other developing economies, China is at the top of the range. "Should we worry about China's debt problem?" asked UBS analysts recently in a research note. "The answer to that question is a definitive yes." Analysts worry that credit is becoming inefficient, increasingly dominated by unregulated lenders, and reaching a scale where it could sap growth if central government is forced to stand behind defaulting local governments or agencies. China's borrowing binge has had its benefits. When the global financial crisis hit in 2008, the government ordered the credit lines open. Banks and other lenders responded, funding massive building and infrastructure projects. In 2009, only one country -- Qatar -- was issuing credit at a faster rate. The increased investment allowed China to escape the crisis relatively unscathed. GDP growth, which had been humming along at 10%, moderated to 8%. But China escaped the "hard landing" experienced in other countries. Here's the problem: credit issuance is once again spiking, but growth hasn't materialized, leading some to question whether China's debt-fueled engine is stalling. "It seems credit growth has become less effective in generating [economic] growth," the UBS economists noted. Adding to the worries, more and more credit in China is being issued by trust companies, securities dealers and underground operators that make up the shadow banking system. At the same time, local government finances in China are notoriously opaque, and financial partnerships with local businesses are particularly murky. Local government debt levels are now so high that Beijing could, at some point, be forced to assume some of the burden. Yet some other analysts believe China's debt woes are overstated, largely because of the role the state plays in the economy. China has trillions of dollars in assets that could be used to pay down debt. Local governments, for example, own land that could be sold to prop up state-owned enterprises. Plus, the economy is still expanding by 7% to 8% a year -- a quick enough pace to absorb much of the growing debt burden. Should the economy slow, however, and loans start to sour, the government may seek to limit the damage by providing financial support to the network of state-owned banks, utilities and manufacturing firms that dominate the economy. According to analysts at Standard and Poor's, the costs would be "spread across the Chinese economy." But they also warn that using government resources in this way would further distort the economy and possibly undermine growth in the long term. "Over the long term, these distortions might prove more costly to the Chinese economy than if banks were to realize credit losses upfront," S&P said.